The freshwater Black River briskly cuts its way through rocky Hacklebarney State Park, cascading around boulders in the hemlock-lined ravine. Two tributaries, Rinehart and Trout Brooks, also course their way through this glacial valley, feeding the Black River. Even in the heat of midsummer, the temperature of Black River gorge is cool and refreshing. Today Hacklebarney is a favorite place for avid anglers, hikers and picnickers, yet in the 19th century the park was a mined iron ore site. The gushing river against the grey boulders and dark green hemlocks creates a majestic beauty in any season. Horseback riding is not permitted in the park. Hacklebarney State Park has very limited access for people with disabilities. Only the parking lot and adjacent restrooms can accommodate wheelchairs. Please contact the park office for further information regarding disability access needs. Text telephone (TT) users, call the New Jersey Relay Service at (800) 852-7899. The park office at Hacklebarney is temporarily closed. 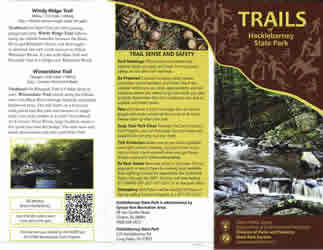 Information regarding Hacklebarney State Park can be obtained by contacting Spruce Run Recreation Area at (908) 638-8572. Deep in the ravines of Trout and Rinehart Brooks are remote places that one can view the glacial moraine of millennia ago, when an ice sheet covered the region. The rock strewn landscape is all that remains of that major geological event; it is also a place that is endowed with a fascinating history. It is said that the word Hacklebarney has a Native American derivation. Depending on which source one reads, it may have come from the words haki, meaning “ground” and barney, a variation of bonihen, “to put wood on fire,” or hakiboni, “to put wood on a fire on the ground” or “bonfire.” Other explanations come by way of the area’s iron-mining history. The first concerns an iron mine foreman named Barney Tracey, who was lovingly but persistently heckled by his workmen – hence the name “Heckle” Barney. Another tradition says the name came from the Irish miners and their home village in Cork County. Finally, the land near the Hacklebarney forge may have been owned by a Barney Hackle. The Black River provides excellent stream fishing year round. During the spring and fall, the NJ Division of Fish and Wildlife stocks the Black River with brown, rainbow and brook trout. Anglers have the opportunity to catch fish due to the excellent holdover rate of trout in the river. Hunting is permitted within 628 acres of designated land that is separate from the day-use area. Fishing and hunting are subject to New Jersey Division of Fish and Wildlife regulations. Picnic tables and charcoal grills are placed in scenic locations along the ravine with a playground nearby on the hillside. Charcoal fires must be confined to the metal grills provided or to grills brought by the picnicker. Wood fires are prohibited. Hiking trails in the northern portions of the 465-acre natural area offer breathtaking views of the Black River, which lies deep within a shaded hemlock ravine. Rinehart and Trout Brooks empty into the Black river and several small waterfalls can be seen from the high trails. The diversity of upland and wetland habitats provides excellent birdwatching opportunities, especially during migration, Since the topography of the park is rather rugged, comfortable walking shoes are recommended. 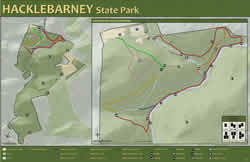 Hacklebarney is a hiking only park, no bikes are allowed on any trails. Can we picnic in the park? Hacklebarney has over 100 picnic tables located throughout the park. They are available on a first-come first-serve basis. There are no picnic shelters located at Hacklebarney. Can we reserve picnic areas/tables? The picnic areas are not reservable and are available on a first come/first served basis. Is there fishing in the park? The Black River has excellent trout fishing, with Brown, Brook, and Rainbow trout abundant. The Division of Fish and Wildlife stocks the Black River, please check with them for dates. 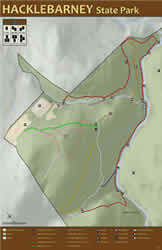 The park has two wild trout streams: Trout Brook and Rinehart Brook. Check with the Division of Fish and Wildlife for questions about bag limits and types of bait allowed. Is there hunting in the park? Hunting is allowed on a 620-acre parcel of land that is separated from the day use area by the Black River. The hunting area is accessible from three parking areas on Pottersville Road. Hunting is subject to Division of Fish and Wildlife regulations. Are dogs allowed in the park? Pets are welcome, but must be leashed at all times.